It has been a little more than a week since Salwa Fahmi Suleiman Gireis, a 64-year old Sudanese accountant has been released from prison on Tues 2nd April. She was detained without charge for 7 weeks by the Sudanese security services, following arrest from her home in Khartoum. Amnesty International had called Ms Fahmi a ‘prisoner of conscience,’ held solely for her peaceful work with a religious organisation. The move comes as tensions ease in Sudan amid improving relations with neighbouring South Sudan. Ms Fahmi was freed from prison a day after Sudanese President Omar al-Bashir on Monday 1st April ordered the release of all political detainees. He said in a speech to Parliament that all political prisoners would be freed, and that Sudan now “guaranteed the atmosphere for freedoms and the safeguarding of the freedom of expression of individuals and groups”. “Today, we announce a decision to free all the political prisoners and renew our commitment to all political powers about dialogue,” he said, without giving further details. The government would continue to communicate with “all political and social powers without excluding anyone, including those who are armed, for a national dialogue which will bring a solution to all the issues,” he added. The same day as Salwa was released, seven opposition political activists were also released – most of them had been arrested after attending a meeting in Uganda, allegedly to plot a coup. Religious tensions and security have been heightened since South Sudan became independent in 2011, with a dispute over oil escalating to the brink of war nearly a year ago. However, in September the leaders of both nations signed a deal, mediated by the African Union, to resume oil sales and set up a demilitarised buffer zone. The oil production from South Sudan started to flow again into Port Sudan in the North on 6th April. The President claimed that his efforts have been made to ease strains and improve relations between the two countries. In the newly formed Muslim majority country, President Bashir has made it clear that he’s set on creating a Sharia state. Christians are increasingly persecuted; over the past few weeks Sudan’s National Intelligence and Security Services (NISS) have ordered more than 100 expatriate workers suspected of being involved with Christian activities to leave the country or face deportation. Ms Fahmi was the last Christian national to be released: she was arrested on February 12th when four men who identified themselves as members of the NISS entered the house and arrested her without providing a reason. Later that same day, the men returned and confiscated her passport and all of the house’s electronic equipment, including laptops, a desktop computer, tablets and a router. Following Ms Fahmi’s arrest, plain-clothed men proceeded to cause havoc at her family’s farm by killing pigs, stealing a motorcycle and sealing up cupboards containing the family’s Bibles. While in detention she was denied access to a lawyer and her family was only allowed to visit her once. Upon her release she was promised that her passport, identification papers and the other IT things that were taken from her home would be returned, but so far that has not happened. The government says the new constitution will guarantee religious freedom, but many Christians are wary because authorities started a crackdown in December; believers say that it has been getting worse, with several Khartoum churches destroyed or locked up by government authorities. The Sudan Council of Churches’ office in Nyala, Darfur remains closed since we first reported this in May 2012. 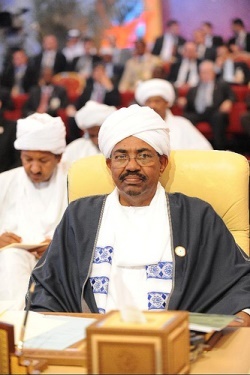 President Bashir came to power in a coup in 1989, and is the only sitting President wanted by the International Criminal Court on charges of genocide – related to the decade-long conflict in Darfur. In March he said he would step down at the next election in 2015 because Sudan needs “fresh blood”.